Used for fighting cellular aging. Many age-related degenerative diseases, such as vascular, neurological and vision problems, originate from glycation and glycosylation, processes in which glucose molecules bind to proteins, "caramelising" them in such a way as to render them inoperative. ¤ Aminoguanidine can prevent the formation of advanced glycation end products and may even destroy certain cross-links. 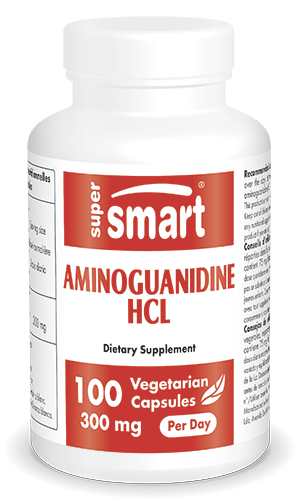 Clinical studies show that aminoguanidine increases collagen density in artery walls, reduces LDL cholesterol, and improves the condition of diabetics as well as kidney function. In a study at the University of Milan, aminoguanidine improved circulation in atherosclerotic patients to such a degree that their capacity for exercise increased by 50-100%. Above all, aminoguanidine protects fragile proteins such as those of the skin (collagen and elastin), the eyes, the nerves and the kidneys, from sugar-induced damage. Aminoguanidine improves insulin sensitivity and often lowers blood glucose levels both in healthy individuals as well as in diabetics. In animals, it increases longevity and survival rates. ¤ Increasingly, scientists consider excess blood sugar to be the second most important metabolic catastrophe' after oxidation that the ageing body faces. It seems that rusting (oxidation) and caramelisation (glycation) combine to transform young, strong bodies into ageing, weakened ones. Aminoguanidine is one of only three identified nutritional substances (the others being carnosine and benfotiamine for these products) which can stop this damage. Each of these substances acts through specific mechanisms and their combined use makes for considerable synergy. ¤ The aminoguanidine we offer is the hydrochloride form (HCL) used in clinical studies demonstrating its efficacy. As its half-life in the body is only four hours, it is best to spread the dose evenly over the day. Each vegetarian capsule contains 75 mg aminoguanidine hydrochloride. Take three of four capsules, spread over the day, at mealtimes. Diabetics may take higher doses on the advice of their therapist.